← Which Americans in denial about race? At first glance, this recent headline from Inside Higher Ed looks like a piece of good news: “Taking a Stand for Science.” Or, consider the alternate title, “Scientists Applaud Ball State President’s Position on Intelligent Design.” Fighting for truth, and earning accolades are good, right? To the contrary, the university’s mandate is of grave concern for those who value critical inquiry and academic freedom. The story is that, after an inquest by an appointed faculty panel, Ball State physics professor Eric Hedin will take remedial measures to ensure that his course, The Boundaries of Science, will be in line with Ball State’s “view that science instruction should be about science and not religion.” This scrutiny results from a complaint and threat of legal action by the Freedom From Religion Foundation. Intelligent design is overwhelmingly deemed by the scientific community as a religious belief and not a scientific theory. Therefore, intelligent design is not appropriate content for science courses. The gravity of this issue and the level of concern among scientists are demonstrated by more than 80 national and state scientific societies’ independent statements that intelligent design and creation science do not qualify as science. The list includes societies such as the National Academy of Sciences, the American Association for the Advancement of Science, theAmerican Astronomical Society, and the American Physical Society. What’s striking about the Inside Higher Ed article is it’s uncritical coverage of the university’s decision. To the author’s credit, she inserts virtually zero commentary; the piece is straight reporting. But, the bias lies in her decision to cite President Gora, and two supportive partisans, while only featuring one voice of opposition. Sadly, the author does not provide comments from informed outsiders on the issue proper. What do philosophers of science and religion think of President Gora’s ruling? What about Constitutional scholars and experts in academic freedom issues? We’re left with a “she said, he said,” tilted three to one. In terms of information, the article leaves much to be desired. What does the Ball State administration mean by “teach,” “science,” and “religion?” Do Neo-Darwinian mechanisms credibly explain the origin of phyla, or might they be the same kind of “speculation” that Gora alleges intelligent design to be? Why does religion “have its place” in the social sciences and humanities, but the scientific establishment gets to determine not just what is science, but what is “religion” as well? While the report remains under wraps, it looks as if scientism is bullying the ivory tower. Thanks to the ever-handy threat of litigation. As for intelligent design itself, I don’t see what’s religious about the theory, or how it’s not a hypothesis that’s at least a valid candidate for becoming a scientific theory. Stephen Meyer advances a case for ID as science in Darwin’s Doubt. In making the radio interview rounds, I’ve heard him repeatedly describe the theory as an inference to the best explanation, drawn from uniform and repeated experience. These same inference principles are used in evolutionary anthropology, forensic science, and the increasingly popular study of animal cognition. Maybe these are just speculations that have their place too. Given that ID draws from the same fossil record used to support the Neo-Darwinian synthesis, it certainly seems that its proponents will be able to make predictions with respect to future discoveries. If we are to take the thesis of Alvin Plantinga’s Where the Conflict Really Lies seriously, a case could be made that some retrenched Neo-Darwinian defenders are propagating a religion of metaphysical naturalism. This is an unnecessary step beyond the epistemic naturalism that has been a cornerstone of modern science. If Ball State is in danger of transgressing upon the First Amendment, it is for establishing a church of atheism, consistent with the beliefs and dogma of the Freedom from Religion Foundation. As John West at the Discovery Institute points out, FFRF initiated this scrutiny to squelch critical inquiry–essential to academic freedom–in the name of Neo-Darwinian orthodoxy. He finds the move is simply Orwellian. Meanwhile, Wintery Knight characterizes Ball State’s clamp down as an inquisition. This is sufficient, but to describe Ball State’s retrograde policy as McCarthyism or a witch hunt would be just as apt. Good article. Really frustrates me how the FFRF gets involved in these things for attention. Thankfully, we’ve beat them in Texas a few times. I really don’t think religion is a science. If religion is a science, then faith doesn’t really come into play, which is a major premise of a religion. If the definition of science involves being able to experiment and repeat the result, then religion is not a science. I also don’t see how it’s an infringement on the 1st amendment. Isn’t this about distinguishing what is science and what is religion? Regardless of the decision, people are still free to believe in intelligent design. Lastly, what bugs me the most is that when the topic of intelligent design (religion) is presented, it’s pretty much talking about Christianity, isn’t it? What about all other religions? Clearly there’s something wrong here because all I see is science vs christianity rather than science vs religion. It seems to me the discussion was already tainted to begin with. I think it’s possible to study the Bible in a scientific manner, but it’s not a science. You can’t reproduce miracles, you can’t experiment with prayers in a consistent, objective manner. Religion simply isn’t a science in this way. I agree that religion is not a science. Science is an inductive method of acquiring knowledge about the natural world. It is a branch of metaphysics, the study of what exists. Theology is another branch of metaphysics, with its own logical methodology. The difference is that it is not restricted to just empirical evidence. Religion is not even comparable to science, because it is not a method of knowledge, it is simply a phenomenon observed by the social sciences, not the natural sciences. I think faith is best analogized by the act of getting on a plane. One does not know that the plane will indeed safely carry you to your destination, but one has good reasons to suspect that the plane will fly and transport you to the destination without crashing in flames. Christian belief avails itself to scientific, historical, and theological investigation, such that we trust its prescriptions. Justified true belief produces knowledge allowing us to act in faith. The first amendment pertains to separation of church and state. It is supposed to prevent religious views from being endorsed or enshrined by government. The declaration that intelligent design is religion is itself an unsubstantiated, religious claim. The religion propagating that claim is Neo-Darwinian orthodoxy. Intelligent design might have proponents who are Christian, but it also has proponents who are agnostic, atheists, Jews, and pantheists. It’s not important who supports it; it’s important what the theory says. Once again, I think Stephen Meyer’s Darwin’s Doubt is a good place to see what the theory itself says. The problem is most people don’t understand what intelligent design says. The press and science establishment are incredibly unsympathetic for cultural and political reasons, and that is a travesty, because it is leading to the general acceptance of certain falsehoods. That is never good. I could be wrong, but I think you make a common mistake of making “intelligent design” synonymous with “creationism” or some other set of religious beliefs. It is, however, completely separate. There are very distinct methods and theories behind determining whether or not something has an intelligent and intentional origin. These methods have been used in evaluating intercepted messages during times of war and signals of various sorts recorded in space. The idea is to try to determine, in those cases, if the various parts of a particular observation occurred randomly or were structured with an intelligent intent. The methods are certainly not infallible, but they are just as logical as much of anthropology and other fields in science where things can not be directly observed, but, as put above, must be inferred. Yes, this has significant relevance to religion on the origins of life discussions, but these methodologies, when applied appropriately, are a science and not religion. Ahhh, Mikey Weinstein and the FFRF. They really are becoming the bane of this nation. And the fact that Mikey has the ear of both Dear Leader and the Pentagon should trouble everyone. Intelligent design might have proponents who are Christian, but it also has proponents who are agnostic, atheists, Jews, and pantheists. Atheism and I.D.? First time I have come across this. Seems oxymoronic on the face of it. How is is possible for an atheist to believe in an ”intelligence” behind creation? Atheist philosopher of science Thomas Nagel was persuaded by Signature in the Cell that intelligence is a compelling paradigm. Intelligibility is evidence of telos. Nagel does not want to characterize his telos as divine. But you are right that there’s a tension there in his identity as an atheist and a realist when it comes to telos. I am more interested in recognized atheist scientists that give ID the nod. If any do? Philosophy is one thing…science another. I am not a scientist so I do not have the background to make an informed decision regarding ID, thus usually turn to he ‘experts’. However, every article I have read has the ‘feel’ of creationism about it. It might be well hidden, but it is there all the same. The tacit hints and occasional reference. Furthermore, every time it has raised its head it seems to get jumped on rather quickly by those considered as recognized scientists, and their reasons are usually the same: at some point , a god is involved, or have I misread /misunderstood their reaction? I wouldn’t underestimate philosophy of science. In college I studied social science, including political science and economics. There are some basic principles that carry across disciplines; correlation does not imply causation, establishing P-values, procedures for multivariate analysis. Now I find philosophy very helpful in integrating knowledge between disciplines. Otherwise, all we have is our emotions. I’m pretty impressed with ID work done by Steven Meyer and William Dembski, even though it has been associated with some politicized courtroom battles. David Berlinski, the computer scientist and mathematician, is an agnostic who is on board with ID. Maybe the whiff of God you pick up from ID stems from it being the antithesis of materialism. It could be called antinaturalist. I find it plausible that the scientific community is, like many academic groups, self-selecting and propagates its own political bias, generally toward greater centralization of decision-making, and treatment of human affairs as rote mechanical puzzles to be solved. These deeply personal and polarizing divides cause many scientists who are dedicated to the project of naturalism to reject ID outright. They will simply say it’s not scientific, without defining what science is. Or they’ll hold a double standard of their choice. Oh well. The overriding point that you seem reluctant to address outright, is why should a god ( which is all ID is masking as) be of any consideration art all all unless one was of a religious bent? For anyone to imply science has some sort of hidden agenda is to impugn a great many individuals who balk at the idea of any supernatural intervention. If prayer worked in the medical field why the hell bother going to a doctor in the first place? Similar comparisons can be drawn in every other field of endeavor where we come up against a brick wall in our investigations. To posit a deity in the picture merely because of cultural inculcation or simple ignorance is downright irresponsible as it tacitly; curtails further investigation. Furthermore, it would be fair to say that the greater majority of the proponents of ID are Christians and many are Creationists. So we are not only talking about a deity being involved but the Christian deity, Jesus of Nazareth. Now that is one hell of a leap of faith to get from human to Creator of the Universe, especially when we might actually be dealing with a narrative construct. If there is an agenda it would seem on the face of it to be with the religious rather than the irreligious. I am prejudice with anything than begins with the assumption that a creator ( with the tacit implication that we are dealing with an anthropomorphised entity) simply because every thing I have come across tries to shoehorn the Christian god into the picture with no regard for genuine science. If scientists are rejecting ID is it not simply because there is no evidence of this (christian) creator? If you measure an argument on its merits i would be interested to know how many ID arguments have been accepted by mainstream science? Is ID judged on the same merits as mainstream scientific inquiry? How many arguments/hypothesis/theories/ have been peer reviewed in recognized journals by recognized scientists? Being religious bears no necessary relation to talking about God (see our Leibniz discussion) or the merits of intelligent design. Questioning scientific claims is not to impugn scientists. That’s an unsupported inference you’ve needlessly drawn. 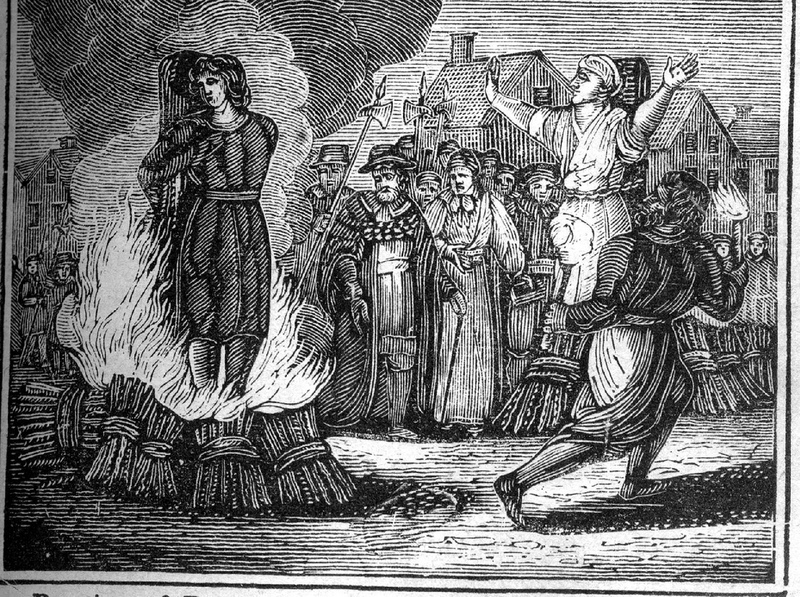 Do you want to silence inquiry, remain ignorant, and burn heretics at the stake? You’ve repeatedly asserted that Jesus of Nazareth is possibly a narrative construct. All knowledge is constructed. Histories are narratives. This does not mean historical knowledge is somehow suspect. Marcelo Glieser recently noted that “we need a science capable of explaining itself.” Every field of inquiry, in the natural sciences, social sciences, and humanities, is constructed by its practitioners. If you’re open-minded, let’s talk about what constitutes knowledge, and what ever counts as evidence, which you keep insisting on. That is, if you are not afraid to be a free thinker. “Why is there something rather than nothing?”</blockquote? Excuse me, I should have addressed this. Leibniz is correct. This is the first question to be asked. But why should a deity feature in the answer? Based on what evidence? So far, none has surfaced. And once again, which deity are we talking about? I may as well ask, why are you so resistant to deity? And I don’t mean an autobiographical reason, like “I had bad experiences with Southern Baptist creationists.” Leibniz and Anselm are not undertaking the quantitative project of cataloging millions of entities called “gods.” They are examining irreducible qualitative aspects of existence, that maybe we can call divinity. Let’s forget the culture wars and deal with the scholarly bodies of knowledge. If you want to discourse with Leibniz, you need to acknowledge the existence of necessary and contingent beings. The maximally greatest being (MGB) that exists in all possible worlds is a necessarily existent being. That through an accident of history it is called “God” seems to be an unnecessary impediment in your pursuit of knowledge. No, I never had a run-in with any religious body,nor was I abused in the vestry by the local Priest, or damned to hell for smoking during choir practice. I merely exercised my ‘god-given’ (sic) brain and utilized a bit of common sense – which included reading scripture- especially the bible; a sure fire way to dispel any and all notions of gods if ever there was one. As I have mentioned to others, there is no way to prove 100% that there is no creator deity, but the evidence presented so far by the religious and especially ”Yahwehists” is utter nonsense and can be dismissed out of hand. I am sure you are aware of this quote? I refer to it often when considering ‘life’ and especially the claims made by the religious. The maximally greatest being (MGB) that exists in all possible worlds is a necessarily existent being. Lol…you will excuse my laughter, but i am not quite ”up on” such high brow terms in my ‘Cromagnum’ neck of the woods. So far not a single argument I have ever read has made me consider that the man-god, Jesus of Nazareth( or any other contender) is ( a valid, or verifiable) part of this framework. It would be nice if those that swear by philosophy so often applied good old Rene’s maxim to their god/religion/religious texts. Pretty soon it would become glaringly apparent what rubbish it really is. I followed up on Dempski and Meyer – I was unaware of who they are and I am a bit disappointed you are impressed with what they stand for and their work. But thanks for the links, anyway. Sorry, but they are basically creationists, or at the least people who put their god/faith ( and I cannot stress the word ”THEIR” enough) first and only then, apply the science. I would never have this nonsense taught to my kids or recommend it in any way shape of form. From here we then get ACE schools. ( Accelerated Christian Education), with YEC idiots and picture books of people riding dinosaurs and such crap. This is not science, but hokum. What is your definition of a creationist? Is this actually consistent with the substance of Dempski and Meyer’s work? Explain. Your words are in need of justification. I have no scholarly qualifications in this regard so I merely did the plebeian thing..Good Ole’ Wiki, which appears to identify him with this bunch of dilettantes, or at least with the (somewhat erroneously named) Discovery Institute. Anyone who posits a god, (and as mentioned it seems most of these consider JC to be that god in one form or another) could be considered Creationists in my book, and most others for that matter. It is merely degrees of Creationism we are talking about, yes? One can believe in Evolution (as do many Catholics) providing God/Yahweh/Jesus was the initial draughtsman, right? Or you can hang your hat with dickheads like Ken Ham who seems to believe T-Rex ran around with the Flintstones. Or you can sit somewhere in the middle with the likes of William Lane Craig, the funniest apologist on the planet and one of the very best cures for insomnia. Doesn’t look like this chap has any more serious credentials either. Way to quote a dismissive partisan. You don’t seem interested in actual ideas. Rather . . . disappointing. Partisan? Should I have dug up one who follows his line? Would that not be partisan as well? It is unreasonable to expect a layman such as moi to have a comprehensive understanding of such a complex subject. Is this not why one tends to go with the consensus? And even in consensus there is often dissent in one form or another. However, what does the consensus say about this and other religious – related matters? Discovery Institute, AIG, ACE schools, Ken Ham ( and his wonderful Kentucky Museum..lol) are all branches of creationism and are generally treated with contempt for being *unscientific. Ah, my dear sir, but it is relevant as if I say Allah is this god you will likely deny this assertion. Or maybe Thor or Shiva or any number of the thousands of gods humans have posited for creation. Or you might even suggest that they all from part of ancient folklore that ultimately leads to a single creator deity and THEN you, as a Christian will say, “Yep…and it is Jesus”. So in the interest of honesty and full disclosure, shouldn’t you tell me where you stand on this crucial issue before we continue? I would therefore, respectfully ask: Do you believe that the character, Jesus of Nazareth, as described in the New testament( Bible) to be the Creator Deity to whom you refer/worship? Questioning scientists from the point of view that those who support Creationism or its derivatives insist they proceed from the position that their god is real – or this is how it appears to the layman, such as me- is dishonest. Or maybe we should all send donations to Ken Ham? Ah..semantics. Let me be try to define the difference as concisely as possible. Based on the available evidence, Neil Armstrong did walk on the moon. Based on the available evidence the character Jesus of Nazareth is a narrative construct. I hope this has cleared up any misunderstanding? I em>love being a free thinker. Exercising my brain is great fun and discovering new “Stuff”” is what life is all about. I read the bible on a fairly regularly basis and have read it cover to cover twice and study bits and pieces that take my fancy. It is a source of great amusement. And it is a load of crap. It is still good ”Stuff” but one could hardly call it factual, especially the Pentateuch and the NT. However, I generally eschew conversations concerned with philosophy and such Stuff tends to meander, and this has no interest for me.